Title: Let's Go for a Drive! GoodReads Summary: Gerald is careful. Piggie is not. Gerald and Piggie are best friends. In Let's Go for a Drive Gerald and Piggie want to hit the road. But the best-laid plans of pigs and elephants often go awry. What I Think: I adore Elephant and Piggie. In my mind, Mo Willems can do no wrong, especially when it comes to dear Elephant and Piggie. 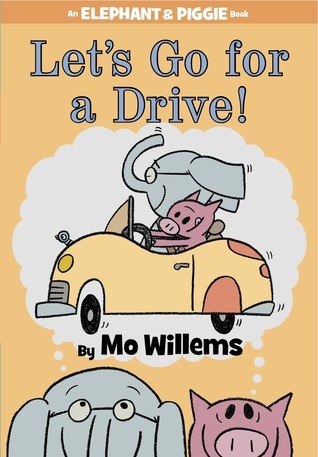 I wonder what Mo Willems thinks when he looks in the mirror. I mean, he has to just be in awe of how brilliant he is, right? I can't imagine what it must be like to be the creator of these so cute characters and their wonderful friendship. Not to boost his ego or anything, but I just stinkin' love these books! I'm so glad this was in at the library. We grabbed it before a drive to Chicago. I was desperate to read it and begged my husband to read it to me since I was driving...and it was going to be a long drive. He's a smart man and obliged. We were laughing and then had the rhymes in our heads for the whole drive. Let's Go for a Drive! might be the most literary of all the Elephant and Piggie books. Right away, I noticed a connection with Of Mice and Men...which made me think of The Pull of Gravity by the insanely awesome Gae Polisner and The Mighty Miss Malone by Christopher Paul Curtis. Just think of this awesome lineup of books to make connections between. Gotta love it. This year, I have been learning about my personality and being conscious of different types of personalities. If you've never taken the Meyers-Briggs personality indicator, I definitely recommend it! It's super interesting to think of how we all have different preferences. I for one, enjoy having a plan. I don't particularly mind making changes to plans, as long as you tell me what the change to the plan is going to be. I do particularly enjoy having things go according to a plan once it's outlined. If I'm going to do something, I'm going to do it right or according to the rules. I prefer to have everything set up and then to dig in so I totally see where Gerald is coming from when it comes to planning for their drive. I just love these friends. Just in case you've been hidden away in a cave eating berries and nuts for the last week or two without access to the Internets, the 2012 Nerdy Book Club Award Nominations have been announced and Let's Go for a Drive! is on the Early Reader/Chapter Book list. Be sure to check out the list and read as many as possible so you can judge which books deserve your vote when the ballot opens in two weeks. Elephant: First, we need a map. Piggie: I have a map! Elephant: GET THAT MAP! You cannot go for a drive without a map! Piggie: I have the map! Elephant and Piggie: Drive! Drive! Drivey-drive-drive! Writing Prompts: Write about a time in your life when you had a plan but things didn't go the way you expected them to. Was it okay that things didn't go according to plan? What did you learn from the experience?